With this item you will earn 10.47 Points in Homespun Rewards! 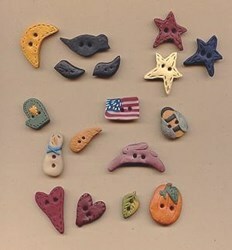 These are individually handcrafted buttons, so each is unique and may vary in color and detail. May be washed in cool water. Star measures 1" x 1 1/2"